In ESP Online, you can use the Quick Search or the Advanced Search to locate products. The ESP Online Quick Search contains a keywords search bar, where you can enter descriptive words for products or product numbers. If you knew the product number, you could also type the product number directly in this search bar. One way to maximize the amount of search results you get is to use the wildcard, or *. The wildcard will give you results with any ending on the base root word. For example, if you were searching for a hooded zippered sweatshirt, you would want to use the wildcard. A supplier could be calling the sweatshirt a hoodie, and the spelling of hoodie can vary from vendor to vendor. One supplier could spell it "hoodie" and another could spell it "hoody". Still, others may state that it is a hooded sweatshirt. In each of these cases, the base root word is "hood." Then, do the same thing with "zip" to get results that include: zip, zips, zipping, zipper, zippered, etc. There is also a price range search which searches the list price of the item. Note: If you wanted to search using the net cost or include a quantity in the search, use the Advanced Search. The Advanced Search is accessible by clicking on the link below the search button. After you have entered your search criteria, click on the Search button. There are two ways to access the advanced search page. One way is to click on the Advanced Search link below the Search button in the Quick Search area. Another way is to click on View in the application toolbar and select Go to Advanced Search. Note: On the Advanced Search screen, you can check the "Always start with this search screen" box to set the Advanced Search as the default. In the top section of the Product Advanced Search (the blue section), there are four boxes: ALL of the words, ANY of the words, Exact Phrase, and Exclude these words. The ALL of the words is a logical "AND" search, meaning that all the words that are searched must be in the product's details. For example, if you entered "ceramic blue mug", every product in the search results would need to have all those search terms in its details. The ANY of the words is a logical "OR" search, meaning that any of the words that are searched could be in the product's details. For example, if you entered "ceramic blue mug", any product which contains at least one of those words in its detail will appear in the search results. The Exact Phrase enables you to type in an exact phrase and all product results will need to include that phrase, letter for letter, in their details. For example, if you needed a V-neck, you could just type "v neck" into the exact phrase box. The Exclude these words will enable you to enter words which you want excluded from the search results. Using the Exclude these words Advanced Search box, products that have the term(s) you entered in their details will not be displayed in the results. For example, if you wanted all V-necks except the ribbed ones, we can put "ribbed" in the Exclude these words section. The wildcard (asterisk) can be used in the "With All of the words" and the "With Any of the words" search boxes. It cannot be used with the "Exact Phrase" or "Exclude these words" search boxes. Next, the additional criteria section (green section) is listed below the boxes. When you begin typing into any criteria field, a pop out box will display with all available options for that area. The available options are provided by the supplier. 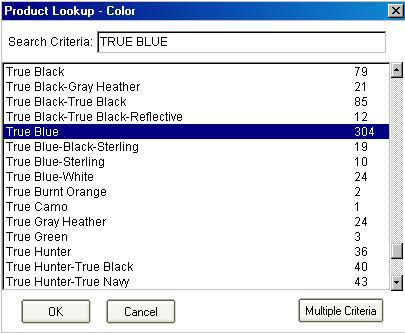 For example, if you are looking for a shirt that you know the supplier calls True Blue, you can select this exact term from the dropdown. However, if you just select Blue, other options, such as True Blue, Royal, or Royal Blue will not appear in the search results. You can also use the Multiple Criteria button to search for more than one criterion at a time. For example, if you wanted to search within the USB/Flash Drives category and the Computer Accessories category, you can use the Multiple Criteria button. First, start typing the first term in the box for the field you want to search – for the aforementioned example, start typing USB/Flash Drive in the Category box. As you type, the application automatically locates the best match and highlights it. Click on the Multiple Criteria button in the lower right corner of the Product Lookup box. A two page view will appear, displaying the Multiple Criteria Selected List next to the Search Criteria box. Click on a category from the list on the left, then click on the right pointing arrow button. That moves the selected category into the multiple criteria selected list. Now, to select another category, follow the same process: type the category in the “Search Criteria” box, click on it in the listing and then click on the right pointing arrow button. 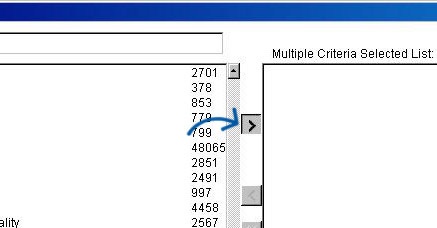 The multiple criteria option can contain up to 30 values from the main list and is available for almost every additional criteria field. After you have added all the terms you need to the Multiple Criteria Selected List, click on the OK button. All of the terms you selected will now display in the Category text box when you return to the Advanced Search area. The Price Range section enables you to search using a price range and quantity. You can select iwhether the price range will be searched by the List Price or the Net Cost. There are also search fields for: Color, Material, Imprint Method, Shape, Size, and Theme. Type values in any of these fields to show a menu of available options to include in your search. The search criterion listed in the middle section of the Advanced Search area are ASI/Supplier Name/Linename/Tradename, Product Number, Production Time/Rush Time, Supplier Rating, Supplier Location and Preferred Supplier Rank. In the field for ASI/Supplier Name/Linename/Tradename, just like with the other areas, you can type in an ASI number, supplier name, linename, or tradename and the matching results will appear. Select the option you want to work with, then click on OK. Note: You do not have to type "ASI-", just type the numbers. If you want to search for a particular product number, type that number into the Product Number box. The checkbox: "Use Coded Numbers" is an option where a specialized product number that has been automatically generated by ESP Online can be used. Because this code is specific to your company’s ESP users, you can only paste in one code at a time and no dropdown will be available. The next section is the Production Time/Rush Time. If you know you will need the item in a certain number of working days, just select that number from the dropdown. Note: Choosing a value in the product time box means you are searching for the standard production time. If you check the "rush time" box, then the results will include suppliers who have a standard and/or a rush production time within the number of days you have selected. The Supplier Rating section enables you to use the dropdown to select the minimum rating you require. Below the Supplier Rating dropdown is the Supplier Location search. Just like the other search boxes, type the city, state, province, region, or country for which you are searching. The Preferred Supplier Rank section enables to you to check which level of preferred suppliers you would like to include in your results. Clicking in the different levels will only show results from the selected rank, all other results will be hidden. Note: Preferred suppliers are set up by your company, not ASI. Placing a check in one of these boxes will ensure that only results classified with the checked criteria display. If you need to clear all the search fields, click on the Clear All button. After you have entered in your criteria, just click on the Search button.